For over 30 years, Contract Cleaning Management has provided high-end cleaning services for all private and commercial offices. We take pride in having a profound experience and a reliable team for all your cleaning services. Highly dedicated and efficient, our cleaners can take full responsibility of your workplace’s cleanliness to make sure you remain focused on your work. From minor repairs to carpet and window cleaning, you can trust our company to provide the services you need. We have complete insurance coverage for all aspects of our business, from the buildings we work on to our office cleaners in Perth. 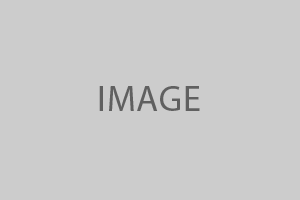 Why Choose Contract Cleaning Management? At Contract Cleaning Management, we are committed to providing high end cleaning and maintenance services so you can focus on your work. 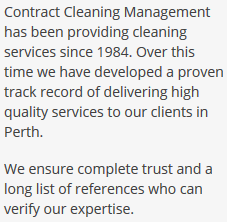 Safety and Security: Our track record in this area is part of what makes us such trusted commercial cleaners in Perth. We have over three decades of experience with building security. All of our clients’ keys and pin numbers are protected in a completely secure storage center. Each office cleaner that we employee is fully covered by various types of insurance for additional safety and security certificates. Flexible Services: We tailor all our services to meet your needs and budget. Our team works around the most suitable schedule and cleaning program services to prevent any disruptions with your workflow. Whether you need daily or monthly services, you can trust our team to assist with your janitorial concerns all-year round. Quality Control: We do not simply keep your office clean. We make sure your space remains functional and conducive for your work. Our company will send an on-site supervisor to maintain office-cleaning standards and address any of your concerns. High Level Customer Satisfaction: At Contract Cleaning Management, we won’t be satisfied unless you are happy with the results. We find ways to monitor all our work to meet office-cleaning standards and correct any issues that may arise. We also make efforts to maintain open communication with our clients, conduct surveys, and ask for input to provide higher levels of service. Now you are searching for a commercial cleaner in Perth, contact our company to get a quote. You can call the following number and speak with our staff: and 0439 963 576 (Tony).